The Sanrio-backed sip, made for grown-up fans, is creating a buzz among beverage buffs. What's ultra-sparkly, rosy of hue, light in spirit, and a fun, longtime interest that's often best shared among friends? If you answered "wine," you'd be correct, and if you answered the world of "Hello Kitty," you'd be correct again. True, wine goes back a few more years, but the Sanrio bow-topped phenomenon, who looks like a cat but is not, in fact, a cat, has been a beloved pop culture fixture for well over four decades. Still, they do have a few things in common, which means wine with the Hello Kitty imprimatur makes sparkly, rosy sense. The LA Times reveals that Torti, a winery in northern Italy, has created a line of libations in partnership with Sanrio, the Tokyo-headquartered company behind the creation of Hello Kitty and a host of other beloved icons. 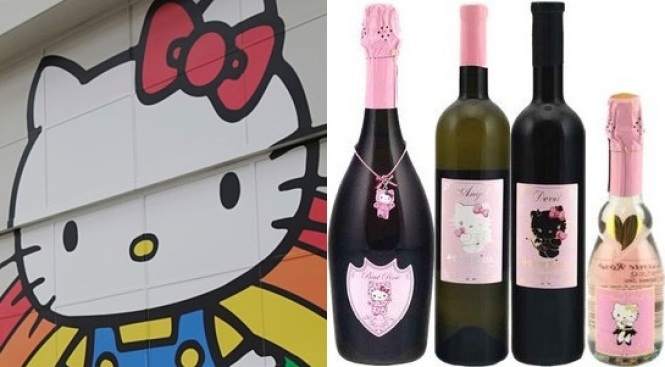 The Sweet Pink Hello Kitty Wine is available in Asia and Europe, per the Torti site, while Sparkling Rosé is debuting in Canada and the United States. Of course, some fans may still have a bottle of the California-made Hello Kitty red wine 2010 on the pantry shelf, the vino created with Syrah grapes hailing from Lodi and Paso Robles. As for drinking the Torti wine? The Times says that Antonello, in Santa Ana, is the place to find it here in SoCal. If wine, at first blush, seems a quirky addition to the superstar's portfolio, consider that her fandom includes a passionate 21-and-over contingent; look to the many Hello Kitty buffs who traveled to Los Angeles for the superlative "Hello! Exploring the Supercute World of Hello Kitty" exhibit, the one that ran at the Japanese American National Museum from late 2014 into the spring of 2015. The wines are a further flowering of the immense and kaleidoscopic product universe occupied by the bow-wearing, positive-of-heart little girl (not cat) and her friends. But the beverages aren't the only sippable dimension to the Hello Kitty. The sweet-filled Hello Kitty Cafe food truck make frequent showings around Southern California, so best follow the beloved figure's bows-on, on-the-road adventures here.